This is one of my favorite products of all time, it is one of the easiest products for treatment of Acne Scars. This mask is a plastic mask with colored LEDs (Light Emitting Diodes, for those curious) inside. There has been some testing with different colored lights and their effect on the skin and the results were as followed. 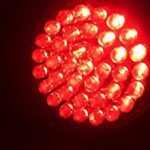 Red Light (650 nm): Has shown to reduce wrinkles, make the skin smoother, help blood circulation, help in the creation of collagen and reduce the size of pores. Blue Light (463 nm): Has shown to kill bacteria (reducing Acne), balance skin tone and relax the skin. Green (463 nm): Has shown to improve sensitive skin and cure surface wounds. Our main point should be the Red LED which helps collagen production and reduce the size of pores and of course the Blue LED which helps kill bacteria thus helping in the treatment of Acne, making this mask a great Acne and Scar treatment. The reason I picked this particular brand is because the mask had the most LEDs (more light), the company is trusted and has more reviews in amazon and there were a few other masks out there that were designed, so they would stop working after a certain amount of uses (that’s a no, no). Is simple, with this mask you are killing two birds with one stone, you have a great source for treating Acne Scars as well as treating Acne (though I still recommend you continue to put on your Acne products). The mask covers your entire face leaving an opening for your eyes, protecting them from the light source. It comes with a band so you can wear the mask and browse the internet (Hopefully browsing on Beautifulclearskin.org). The mask has different levels of power for the light strength as well as a timer, so you know exactly how long you are wearing it and at what power output. Of course! Do note that it is recommended for you to wear the mask only about 20 minutes and 6 times a week. There is no research suggesting any negative side effects of the LED therapy, but everything in moderation is better. This means you have 20 minutes to play with the settings, so try these settings according to your situation. Acne + Scars: Use in highest power 10 minutes Blue then 10 minutes Red. Some Acne + Many Scars: Use highest power 5 minutes Blue then 15 minutes Red. Acne or Scar only: Use highest setting 20 minutes Red for scars or 20 minutes Blue for Acne. If you are using both colors in one sitting always start with Blue, I’ve noticed that Blue kills bacteria in the pores and Red would later smooth my skin out and reduce the size of the pores. Use the mask 6 times a week preferably at night, so as soon as you are done you can go to bed and let your skin rest. Use an alcohol wipe or wet wipe to clean the inside of the mask after each use, you don’t want sweat or bacteria from the last time you used it to get get stuck in there. Also consider washing your face before using the mask to remove any dead skin cells or any Acne product you used, that way the light will shine on a clean skin surface. Another important thing to consider is; there have been some small research that suggest the Red light can make your thyroids act up, while it is not proven better safe than sorry, I usually wrap a towel around my neck and collar bone, so there is no light hitting my thyroid area. While wearing the mask with the Red light, doing villains’ movie quotes make you look and sound pretty cool. Click on LED Photon Therapy Mask to learn more over at Amazon, this is a wonderful treatment for Acne scars. Not only it is great for scars, but it can also be used for Acne treatment, after using it for a few months people started noticing a difference in my skin, it looks a lot smoother and much healthier. This product also has great reviews in amazon as well as other websites and research that mention the effectiveness of Red and Blue light on your skin. Feel free to comment or ask any questions and I hope this wonderful treatment puts you on the path to Beautiful Clear Skin. Enjoy. This is very interesting. It actually makes a lot of sense using light therapy and it’s non abrasive which is always a better route rather than putting really harsh chemicals on the skin. I am definitely going to give this a try, I love skin care and trying new advancements in the industry. Thanks for the great article. I can’t wait to try it! Hello Kristin, thank you for commenting. I agree, this is a much better, non abrasive method that works. I try to recommend products that aren’t so harsh to your skin, yet are still very effective, glad you liked the article and hope you get great results. Cool..the LED photon therapy is a new acne treatment in the cosmetic world indeed. I always searching for the new acne treatment method instead of reading the reviews of old skin care product. This kind of treatment is very effective and one of the best things is this product doesn’t involve any chemical that can give short/long term effect. However, I still doubt if this product can cause the skin dryness? This product is an excellent acne and scar treatment, It is not tough on your skin and does not have any side effects, I’ve never noticed any dryness, what I’ve notice is that my skin feels really smooth and soft after using the light, of course I always recommend moisturizer when using any Acne or scar product. Thanks for reading. I was a long time sufferer of acne and this would have been something I might have used back when my acne was really bad. It seems like it would be a great natural alternative to some of the harsher chemicals you can use for acne. Is it he sort of thing you would have to keep using in order to get results? Or is it something you would use for say 3 months which might actually provide some kind of cure for acne. What are your thoughts on Proactiv Solutions? Would you recommend them? It is, no harsh chemicals here, the results are permanent since basically you are stimulating collagen production to reshape your skin, so 6 months of this will give you permanent results, you could still use it from time to time for wrinkles, acne or new acne scars. I tried Proactiv and did not see any results, looking at the list of ingredients you can find better cheaper alternatives on the products I’ve recommended, I believe Proactiv’s popularity came from their huge advertising campaign, not its effectiveness, thanks for reading. As someone who has suffered from acne for many years, getting rid of scars has always been the toughest thing to get over. I have tried everything to get rid of them, but nothing seems to work. I must admit that i have never heard of this therapy mask, but it looks very interesting. I am looking forward to learning more. Thanks! I know exactly how you feel, I can personally recommend you all the products on the site, this is truly one of my favorites and I know it will do wonders for you just like it did for me and many others who have used this product, thanks for reading. There is apparently increasing evidence that high energy blue light can cause damage to the eyes, especially macular degeneration later on in life. I was wondering therefore, when using this product, how much light shines into the eyes? Does anyone recommend wearing dark goggles while using it? You are correct, this isn’t the best light for your eyes, this mask however has protecting shielding on the area surrounding your eyes protecting them, the light never hits your eyes, so there is absolutely no concern. For other products on the site like the LED bulbs goggles are recommended and included. I wouldn’t recommend you anything that I didn’t fully researched and checked the side effects, no worries. Thanks for reading. Wow! This is the first time Iâ€™ve heard of such treatment. I just wonder how long have you been using this product? And how is it so far? Is there any side effect that you encounter when using this product? Because for me, personal opinion only, my skin will get irritated if using any face mask. And it will get worst that my skin will become red like a tomatoes. I find it very difficult to look for any face mask treatment for my skin. This treatment sounds interesting, what with using the led as a therapeutic measures, and you even have add-in some tricks and tips to use this product. The thing Iâ€™m worried about the missing testimonials from other users when you reviewing such product though. Hey Syikien, this is a great treatment with no side effects. I’ve been using it for about 5 months and people have noticed a difference in my skin, so far it has been a wonderful experience and I still use this product to help with my scars and acne. 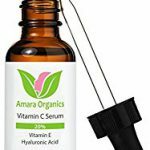 I understand the doubt since it is only me reviewing my experience, fortunately Amazon is also full of great reviews that will certainly help you see this is an amazing product that works and of course because of my experience with products, acne, scars and dry skin I can provide some great tips and tricks to help, thanks for reading. Wow awesome technology, thanks for sharing! How many days do you have to wait before seeing significant results? Reading this article, it makes me think of the scars you have once you get rid of a tattoo. Do you think such a technology can help get rid of this kind of scars as well? No problem, sorry to break it to you, but getting rid of scars could take months if not years depending on how old the scar is. You will notice a difference in a few months, as your skin gets smoother and softer. While there isn’t much data on the effects of tattoo scars, it is believed it will help since all you really doing in increasing collagen production encouraging growth of new smooth skin over the scar. Thanks for reading. I had severe acne as a teenager and although it didn’t leave me with scars, it left me with annoying pock marks! I have tried different creams and serums but none have obviously worked. I recently met a lady who introduced me to the Galvanic Face Spa from Nu Skin, I’ve not tried it yet because it’s quite out of my budget currently but this seems like a cheaper option? Do you have any reviews on Nu Skin products? Does it work for pock marks as well? I understand how you feel, as someone who had some icepick and chicken pox scars I can relate. Galvanic Face Spa is used to stretch and flatten the skin, so it works mostly for wrinkles. The problem is, it is only temporary, so you must keep doing it and some skin types simply do not see any results. Because of this I do not have reviews on this company or its products, light therapy like this product however stimulates your collagen production giving you permanent results, it will help smooth out your skin making pock mark scars less noticeable, but like with all treatments it will not fully get rid of them, hope this helps, thanks for reading. What an interesting article! 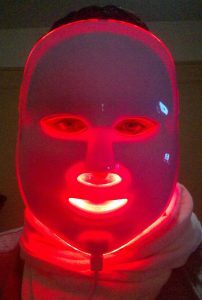 I love the fact that the LED Photon Therapy Mask can actually kill bacteria and reduce wrinkles! This, I definitely need! I don’t take care of my skin the way that I should, but this should be an easy way to treat the acne scars and wrinkles without having to use all of the other time consuming products! Thank you for such an informative article! This is a great product for acne and acne scars! I also know many people who use it exclusively for wrinkles and scars. It is a great product with many benefits that only takes 20 minutes a day, it is one of my favorites! thanks for reading. I like what this product does. Amazing! I no longer suffer with terrible acne as in the past but I do have the scars on my face. I tried using creams but they don’t work as I’d like to. It always leave part of my face lighter than other parts of my face. I don’t like that inconsistency. So I’m happy I found your article. What have been your experience with it? How soon after using it before you started seeing results? 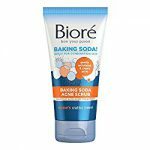 This product is wonderful, I use both lights blue for acne and red for scars. Because we are talking about scars here if you use it for six days a week for twenty minutes each time you should expect to notice results in about 12 weeks, It’s a while I know, but there are no overnight miracle scar products. This mask is worth it and I continue to use it today, it covers your face completely so there will be no inconsistency in your healing, after each use you will feel your face smooth and soft giving you a temporary great look, hope this helps, thanks for reading.